There is a distressed man standing in the company of a few other men, who seem to be on board a ship. The man, definitely, doesn't look happy. He seems to be deep in sorrow, because his neck is hung low and his hand slapped on his forehead. 1.2. Why does he have the bird hanging around his neck? 1.4. What is an albatross? An albatross is a large sea-bird with a wing span of about 4m. (b) The wedding guest remarked that he was 'next of kin' which means that ……..
(d) 'The sun came up upon the left, /Out of the sea came he ;'This line tells us that the ship…………………. (f) The storm blast has been described as being tyrannous because………. (h) The sailors were happy to see the albatross because……..
(k) 'God save thee, ancient Mariner, /From the fiends that plague thee thus!- Why look'st thou so?' means………. (b) Was the wedding guest happy to be stopped? Give reasons for your answer. No, the wedding guest was not happy because he was forcibly detained by the ancient mariner whareas he being a close relative of the bridegroom, was expected to reach there well in time. The guests had already arrived there. The feast was set. The loud sound of bassoon could be heard. The ancient mariner looks lik a lunatic with his grey long beard with glittering eyes, His hands were rough and skinny and he had a mesmerising gaze. 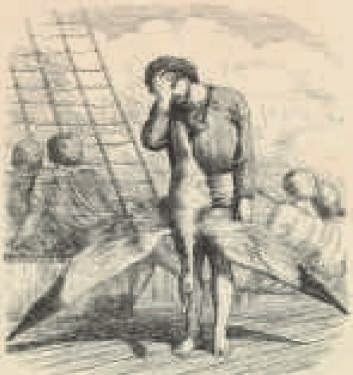 The mariner was badly ridden with a sense of guilt and remorse after the wanton act of killing the Albatross.He is cursed to be haunted indefinitely by his dead shipmates, and to be compelled to tell the tale of his downfall at random times. The weather was pleasant and sunny at the beginning of the journey. The sun came as if appearing from the innards of the sea. The sun was bright day after day during the initial phase of the journey. The sailor started their journey happily. But after a very short spell of smooth journey a very turbulent and violent sea-storm rose. The storm was so powerful that it completely overtook the ship and drove the ship to the extreme South. In this way, the sailors reached the land of mist and snow. (h) How do we know that the albatross was not afraid of the humans? Why did the sailors hail it in God’s name? Albatross didn't fear humans because it followed the mariners day and night and ate and played with them as well. The sailors hailed it in God’s name because it was a messenger from God which lifted the fog and mist. 8. There are a number of literary device used in the poem. Some of them have been listed below. Choose the right ones and write them down in the table as shown in the example. In each of the cases explain what they mean. (b) Why does the mariner say that 'no sweet bird did follow'? (d) How did the sailing conditions change after the ship had moved out of the land of mist and snow? What or who did the mariners blame for this change? The sailing condition changed for the worst after the ship had moved out of the land of mist and snow. Their ship was stuck in the silent sea. The breeze dropped down, making the sails drop down as well. The ship came to a standstill. The mariners blamed the ancient mariner for this change because he had killed the albatross which brought the breeze. (e) What is indicated by the line 'The bloody sun, at noon,/Right up above the mast did stand,/No bigger than the moon'? ‘bloody’ shows how unwelcome the sun was. (f) How does the mariner describe the fact that they were completely motionless in the middle of the sea? The stanza “Day after day, day after day,/We stuck, nor breath nor motion,/As idle as a painted ship/Upon a painted ocean,” portrays a still picture of the sea and the ship. The ship was surrounded by the water on all sides. The sailors were in the middle of so much water but they did not have single drop of water to drink. The water of the ocean is salty, and thus inappropriate for the sailors to quench their thirst. The mariners were feeling thirsty but they didn't have water to quench their thirst. Their tongue had become completely dry at the root. They couldn't speak because they felt if their throats were chocked with soot. 12. Like part one, the second part also has a number of literary devices. List them out in the same way as you had done in question number seven and explain them. 13. What is the rhyme scheme of the poem? In most of the stanzas of four lines the rhyme scheme is abcb. In the stanzas of six lines the rhyme scheme is ababcb. 14. Find examples of the use of interesting sounds from the poem and explain their effect on the reader. The answers are good and also to the point. Ans. the icebergs split and a strong breeze started blowing. I think that is the right answer. best for online study. thanks studyrankers !! Helped me , thank you.